We’re proud to announce several new features, including a new HaasBot. Our Crypto Index HaasBot allows you to grow your altcoin portfolio like a professional — we’ve created a YouTube video to help understand this new trade bot. We’ve improved our Bollinger Bands technical indicator as well as updated one of our widgets. Note: You need to have an active Haasbot license to participate in beta testing. Haasbot 2.2.4 has been released! We have released Haasbot 2.2.4, which is a minor release to address the API changes to Huobi, Bittrex, and Cryptsy. Additionally, we have upgraded the whiteserver software to increase the speed of backtests and price data transfers by a significant amount. This release will delete previous price data, so be sure to give Haasbot some time when you first create a bot/first start it up, as it will grab all of the price data from our servers. It should take maximum 2-3 minutes to grab all of the data for each pair, but once you have the price data, its there and you are all set. All you need to do is right click on Haasbot in the system tray –> Check for updates, and run the installer. This build is also available in OSX and in Linux. If you have an active license and have an activated forum account, simply head over to the OS’ build that you would like to run and you will be good to go. This will be the last update before Haasbot 2.3 goes into beta, as we need to put our effort into putting the final touches for Haasbot 2.3. As always, if you have any questions or need anything, let us know! Haasbot 2.1.4 has been released! 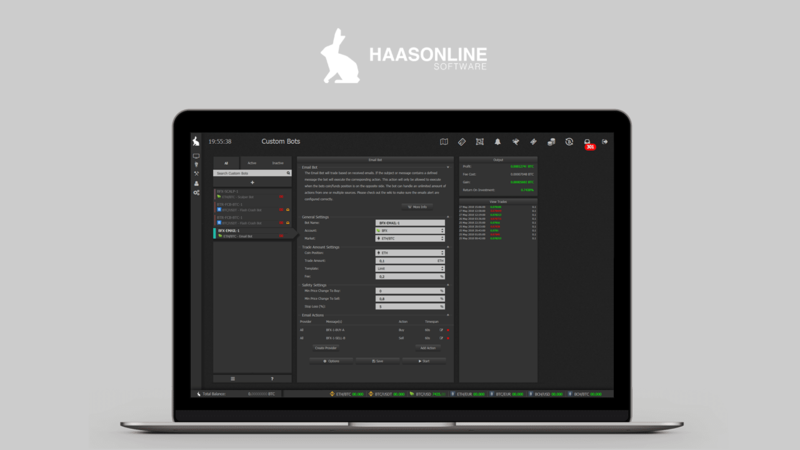 We have released Haasbot 2.1.4 which is a very minor release. It is the same as Haasbot 2.1.3 but with the new coins added to it. We hope that you guys enjoy it and are getting ready for the massive update that will be coming in a few weeks, which is Haasbot 2.2. Everyone must update to Haasbot 2.1.4, as there is a DRM update in this as well. New coins added: Cbx, Cin, Doged, Zrc, Sup, Lyp, Ecach, Gsm, Wbb, Xco, Ilt, Mtr, Risk, Vnl, Lyb, Mine, Asn, Ldoge, Omc, Zirg, Xdb and Dash. As always, let us know if you encounter any issues please let us know!